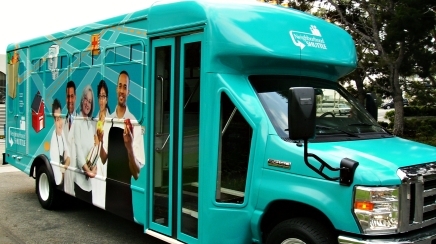 Molina Healthcare launched its first neighborhood shuttle last May in Fontana, CA, to provide residents of low-income neighborhoods access to healthy food, activities, and healthcare services. Molina Healthcare provides a range of healthcare services for those who qualify for government-sponsored programs, such as Medicaid. The in-house PR team launched the company's first neighborhood shuttle last May in Fontana, CA, to provide residents of low-income neighborhoods access to healthy food, activities, and healthcare services. “Our CEO Dr. J. Mario Molina believed he could make an impact in the community by introducing free, reliable transportation, so we did it and PR took the lead,” explains Kathleen O'Guin, AVP of PR and marketing. Fontana was selected because O'Guin says it fits the USDA's definition of a “food desert” (communities with low access to fresh healthy food). A 15-mile route was devised, and the team worked with businesses along it to establish stops and promote the shuttle. “We built it through word of mouth and relationships with community-based organizations,” O'Guin explains. Local media relations also helped raise awareness. A bilingual shuttle driver was trained in messaging and handling special needs riders might have. An orientation was hosted in May at the Fontana Community Senior Center to acquaint riders with the driver, the bus, and the route. Businesses got collateral, including maps (in English and Spanish), stickers, and buttons. Maps were also distributed at Molina's offices and at neighborhood events. The team produced a DVD of health tips that plays on the shuttle. The shuttle itself is wrapped in graphics depicting route stops. A second shuttle launched in San Bernardino in July. Media, elected officials, and local partners were invited to an August 3 launch event at housing development Waterman Gardens, an important stop on the San Bernardino route. Gloria Calderon, president of American Family Care, which manages Molina Medical Clinics, notes Waterman Gardens approached Molina about providing a shuttle after seeing media coverage of the Fontana shuttle. Fontana monthly riders increased dramatically from 81 in May to 241 in October (with a high of 274 in August). Riders stopping at the clinic increased from seven in May to 20 in both June and July, 30 in August, and 26 in September. Monthly riders in more densely populated San Bernardino increased from 177 in July to 323 in October (with a high of 369 in September). Riders stopping at the clinic increased from 20 in July and August to 53 in September. Fifteen hundred maps, 2,000 newsletters, 50 stickers, and 45 buttons were distributed. Two shuttles are expected to launch in the Sacramento area early this year.